« Red Rocks: Papadosio, Alex Grey, Sunsquabi, Desert Dwellers, Eliot Lipp, Antennae, Supersillyus! Proceeds from event will benefit Dave’s daughter, Jaz Hunter. Dave Hunter, a visionary poster designer who has created work for Metallica, the Neville Brothers and Dr. John, Les Claypool and many more, is a gifted artist who is currently fighting for his life with brain cancer. Fortunately, he has many friends, among them Steve Kimock, for whom he has created considerable art. 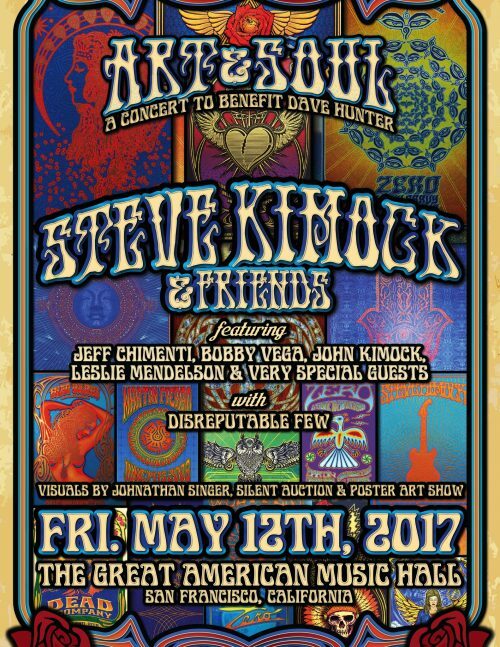 On Friday, May 12th, Steve Kimock & Friends, featuring Steve Kimock (Zero, the Other Ones) Jeff Chimenti (Dead & Co.), Bobby Vega (Zero, Sly and the Family Stone), John Morgan Kimock (Mike Gordon), and Leslie Mendelson (Bob Weir), plus very special guests, will take the stage on Dave’s behalf. Divine and illuminating visuals will be by artist Jonathan Singer. There will be a silent auction and a poster art show. We can’t get through life alone. “Art and Soul” will not only be a joyous celebration through elevated music, but a healing experience that not only Dave but all attending can share in.